1. to turn along an axis while moving forward along a surface. 2. the act of rolling. 3. an object that has been rolled into a cylindrical shape. 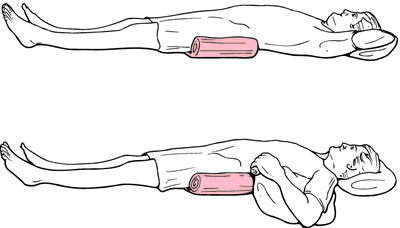 trochanter roll a wedge (usually a rolled towel) placed from the crest of the ilium to midthigh to prevent external rotation of the hip when the patient is in a recumbent position. Use of trochanter roll to prevent external rotation of hip. 1. A mass or structure of a rounded or cylindric form created by rotation of a layer of material around its own long axis. 2. The process by which a round entity is moved by a pressure gradient, as when leukocytes move along a blood vessel wall. intrinsic joint movements on an axis parallel to the articulating surface. The axis can remain stationary or move in a plane parallel to the joint surface. A usually solid, cylindrical structure. A cylindrical mass of purified and sterilized cotton used as packing or absorbent material in various dental procedures. A sausage-shaped mass in the left iliac fossa. It is due to a collection of feces in or induration of the walls of the sigmoid colon. An air-filled, foam, or gel cushion placed behind the lower back as a support. It is used to maintain the normal lordotic curvature of the lumbar spine and thereby to relieve pressure on commonly injured structures such as discs and facet joints. A cushion or pillow used to hold the hip of a postoperative patient in neutral position. 6m), after 44 roll overs gave the country a case of lottery fever. The canoeists I spoke with did emergency escape rolls and roll overs in fast weir water and wore short sleeved wet suits. However, Finance Minister Daniel Marx said the government will have to restructure $11 billion more in debt next year, mostly through roll overs and refinancing.